The global industrial sugar market is impacted by factors such as rising international prices, value added to sugarcane products by targeting byproducts through expanded sugar production, integrated sugar complexes, and the rising consumption of beverages and readymade foodstuffs. In addition to this, innovative product launches and greater application of industrial sugar in a variety of areas is poised to benefit the industrial sugar market. Persistence Market Research has conducted a fact-based study of the industrial sugar market in its upcoming report titled ‘Industrial Sugar Market: Forecast, Trend Analysis & Competition Track – Global Review 2017 to 2022’. The report has looked at key trends in the industrial sugar market over the five-year forecast period. 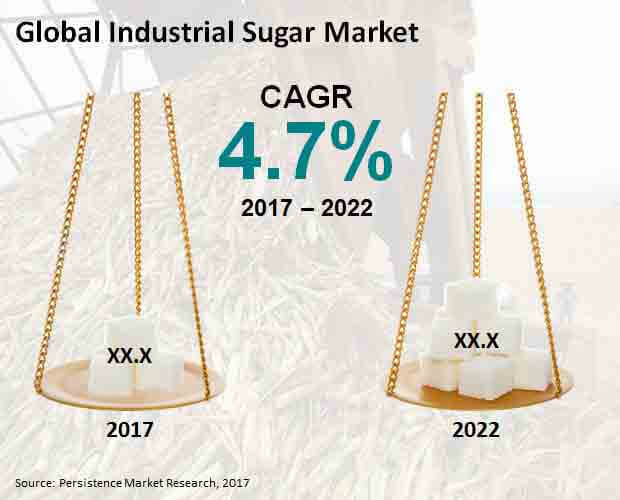 The industrial sugar market report begins with the executive summary where the historical and projected expansion of the industrial sugar market is analyzed. A comprehensive overview that includes the definition and the taxonomy of the industrial sugar market is provided in this section. The definition can be referred to by readers who seek to gain a grassroots understanding of the industrial sugar market. The industrial sugar market estimates in terms of important metrics such as Y-o-Y growth rate, CAGR, and absolute dollar opportunity are mentioned herein. The industrial sugar market report then highlights the industry trends, pricing, supply chain, and cost structure. The market dynamics i.e. the drivers, restraints, opportunities, and threats of the industrial sugar market can be expected in this portion of the industrial sugar market report. An intensity map that charts the presence of key stakeholders across all regions concludes this chapter of the industrial sugar market report. An important chapter in the industrial sugar market report focuses on the segmented analysis and forecast of the industrial sugar market. The industrial sugar market has been classified on the basis of region, source, product type, and industrial use. The report includes cross-segmental data that can prove extremely useful to the report reader. A competition analysis is necessary in a market as competitive as the industrial sugar market and the report competition landscape serves this very need. Several prominent companies actively involved in the industrial sugar market have been profiled. A brief company overview, recent developments, long-term strategies adopted and financial ratios are available in this part of the industrial sugar market report. A competitor SWOT analysis is possible and is beneficial for the purpose of devising long-term business and investment plans. The industrial sugar market report has given an equal amount of attention to both developed as well as emerging economies. The developed regions consist of North America, Europe, and Japan while the developing world comprises Latin America, APEJ, and MEA. A spotlight has been shone on the largest countries in every region and a historical analysis of these has been compared and contrasted with the anticipated future growth in the industrial sugar market. Companies that seek to enter only certain geographies with the maximum growth potential in the industrial sugar market may refer to this part of the industrial sugar market report. Sugar is easily one of the most important commodities worldwide, if not the most important, as it is widely consumed in a variety of different foodstuffs. The global industrial sugar market is largely shaped by expanding sugarcane production, rising prices of sugar, trends observed in the industrial beet sugar market, and the consumption patterns of ready to eat foodstuffs and drinks. In addition to this, innovative product launches that allow the use of industrial sugars in even more use-cases is poised to benefit the global industrial sugar market. The industrial sugars market is predicted to record a moderate CAGR of 4.7% for the five-year study from 2017 to 2022. The cane industrial sugar segment is anticipated to be worth more than US$ 75 billion by the end of the forecast period, making it a massive opportunity for all key stakeholders. APEJ contributes slightly under 2/5th of the revenue in 2017 and is likely to increase this share going forward. The beet segment occupies a quarter of the revenue share in the industrial sugar market and thus companies are advised not to ignore it entirely in favor of cane. The highest growth in terms of CAGR is estimated to be in the MEA region and companies are recommended to take this into account while devising their strategies in the industrial sugar market. The raw segment holds the lion’s share in the industrial sugar market by product type in 2017 but is nonetheless on track to lose share going forward. The raw segment is projected to record a modest CAGR of under 5% for the period 2017 to 2022. APEJ is larger than the next two largest regions combined by revenue in the raw segment of the industrial sugar market. The refined segment is considerably smaller than the raw segment and has a revenue share of approximately a tenth of the industrial sugar market in 2017. Companies could look at targeting the MEA region as it is poised to witness the highest CAGR for the forecast period. Brown segment has a single digit revenue share in the industrial sugar market by product type in 2017 and is unlikely to threaten the position of the refined and raw segments anytime soon. APEJ is the only region assessed to cross a value of a billion dollars in the brown segment of the industrial sugar market by end 2022 and companies may want to customize their investment decisions keeping in mind the needs of consumers in the APEJ region. Sweeteners have become popular in recent times and they have the largest revenue share in the industrial sugar market by revenue share. Along with APEJ, Europe is assessed to represent the maximum opportunity in the sweeteners industrial sugar market. The report has profiled some of the prominent companies in the industrial sugar market. They include Suedzucker AG, Associated British Foods, Tereos Internacional, Mitr Phol Sugar Corporation, Louis Dreyfus Holding, Wilmar International, American Crystal Sugar Company, E.I.D.-Parry (India) Ltd., Shree Renuka Sugars, and Cosan SA Indústria e Comércio.